Oh where to even begin? But many folks who use their cast iron regularly, don’t realize how versatile something like a skillet is for ordinary baking. Food tastes better in cast iron. If you’ve ever had macaroni and cheese baked in a cast iron skillet or a casserole cooked in a dutch oven instead of a traditional casserole pan of aluminum or glass, you know what I mean. 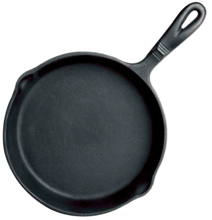 Cast iron provides a texture to the outer layer of food that just can’t be duplicated in other pans. Baking is VERY “healthy” for your cast iron’s seasoning. If you only use your skillet on the stove top, you will probably have to re-season it (at least the inside bottom of the pan) more often than you will if you’re using it inside the oven, too. So rethink how you bake in the oven. Do you normally grab a cookie sheet? Casserole dish? Pizza pan? Next time, take a look at your cast iron and see if you have something that might work instead. You may find that the quality of your food is a whole lot better!